Leica DISTO ™ D5 Outside viewing – no problem! 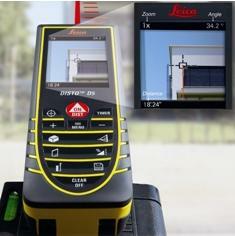 The Leica DISTO ™ D5 has the only high resolution 2.4" digital color Point-finder display and a 45 degree tilt sensor in the industry. These features combined with a host of calculation functions make the Leica DISTO ™ D5 the best hand-held digital laser distance meter ever! Using the tilt sensor you can also take indirect measurements. From this, the horizontal distance can be calculated in spite of obstructions. The D5 is packed with a variety of different calculation functions including area, volume, trapezoid, area of triangle, Pythagoras, and tilt based calculations The Leica DISTO ™ D5 can excel in almost any measurement situation. Measuring accuracy typ. ±1.5mm/ 1/16"
Weight with batteries 6.88 oz. Our DISTO ™ range comes with a 2 year warranty, however if you register on line at www.disto.com within 8 weeks of purchase you will receive an extra years warranty.